Some years ago a close relative who was also a good friend asked me to read the draft he had prepared of his adventures since volunteering from Jersey for the British Army in 1939. He had been at Dunkirk, St Malo, the Western Desert, Sicily, Italy (including Monte Cassino) and Burma and had campaign medals right across his chest. Despite being in the thick of almost all the major theatres of war except D-Day, what he had written was boring, boring. I tried to put my critique nicely but in the end it would have been unfair not to have been honest. The manuscript remained just that - a collection of school exercise books - and I lost a friend but kept a relative. Thus it was that I approached Ian Ronayne's newly published book with some trepidation. Not because I feared for Ian's writing style - I had already had a preview of a chapter and knew his words would flow easily. I am a fan of Richard Holmes and Bruce Catton, historians who invoke in their writing the techniques of thriller writers whose skill is to hold your and keep you wanting to turn the pages. But while history is often thrilling, unlike the conventional thriller, we know the ending before we read the first page. The true skill of the history writer is to keep us enthralled along a road where we already know the destination. This Ian achieves with the apparent ease of someone already well-practised. In the published histories of the Great War, the role of the Channel Islands is not writ large. Even in the Islands themselves, despite the ubiquitous war memorials commemorating the 'glorious dead', the unique experience of the Second World War, when the enemy was not so much at the door as in the front parlour, is overwhelming. However, along with the rest of the British Empire, the impact on Island families from the loss of a loved husband, son, brother or lover, was far greater in the first global conflict than the second. That Jerseymen (and the book that records the role of Jerseywomen has yet to be written) flocked to the colours when they need not have done has now been meticulously and often movingly recorded. Against the vast backcloth of the Western Front and the emotions evoked by the fate of many 'Pals' battalions, the Jersey 'Pals' have earned, so far, little recognition. Unlike their Guernsey counterparts, there was no Royal Jersey Light Infantry, and the fates of the Jerseymen were very much linked with that of the Royal Irish Rifles. Ian answers a question so often asked. Why the Royal Irish Rifles? What special link was there between this island and that Ireland? The answer is very prosaic. The Royal Irish Rifles were short of men and would have taken them from anywhere. Ian fills in a lot of detail and in particular explores the relationship between the Island and its men at the Front. What he paints is a much more complex picture than has hitherto been the case. What we learn is that there was much more to a group of volunteers going happily to war singing that it was a long way to Tipperary. The island's attitude towards its potential heroes was at best ambivalent and at worst very much a case of out of sight, out of mind. Why this should have been so is explored in considerable detail. Much of the book is written in a distinctly 'novelish' style. I was particularly impressed with the prologue in which Ian displays techniques that would certainly grace the opening pages of a novel and I suspect that behind the historian is a novelist waiting to show himself. Ultimately most war histories are stories of tragedies and this is one of them. It is also the story of a group of young men (and in the case of their CO, not so young) who deserve the recognition that Ian's work has now finally afforded them. Altogether more than twelve thousand men from these Islands fought in the Great War, many with considerable distinction. Indeed the proportion of men who rallied to the colours (and, more tragically, their losses) was greater from the Islands than from any other community in Britain. This is often overlooked. While Ian's book does not address this particular wider aspect, it does give its reader a much greater insight into why this might have been. 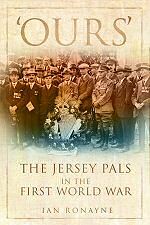 The Jersey Pals, whose story 'Ours' is, were a relatively small cog in that larger wheel. In his Foreword His Excellency Lt General Andrew Ridgway writes that this book will ensure that the memory of the Jersey Company in the Great War and the bravery and devotion of this loyal band of 'Jersey Pals' will live on forever. In his introduction Ian suggests that he had not expected to have to write the book because surely it had been written already. I am glad he did and his work deserves a wider readership than it is likely to get.